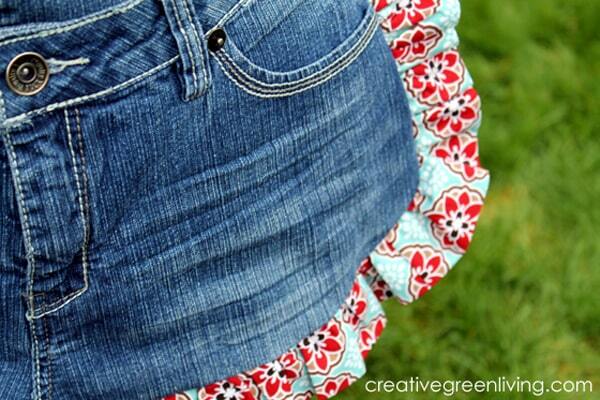 Hi friends, it's Natalie from Doodlecraft, sharing a fun upcycled clothing craft with you. Do you have stacks of worn out t-shirts with fun graphics? Maybe some old band shirts, sentimental shirts from a loved one or some shirts that just don't fit anymore? 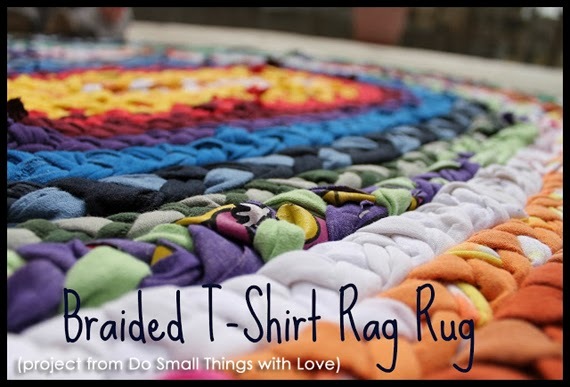 Let me teach you how to turn that old t-shirt into a pillow! 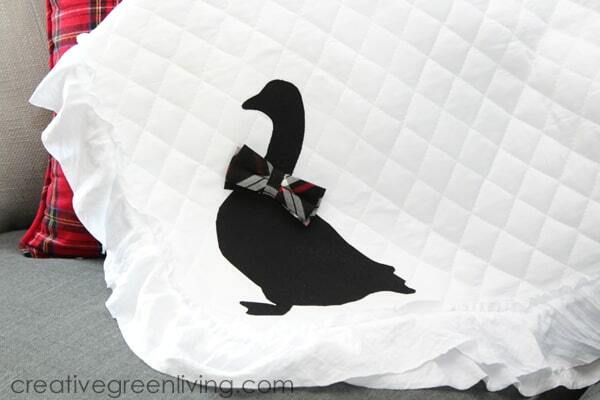 This upcycled t-shirt pillow craft is a great beginning sewing project for older children or teens. Hi, everybody! I'm Paige from Little Nostalgia and it's the mooooost wonderful tiiiiiime of the yeeeeeear! I've been clocking a lot of time making gifts and getting the house all gussied up before we host our families later in the month. One thing I've become more aware of over the last couple of years is how many paper goods (napkins, gift bags, tissue paper, etc.) one family can burn through during the holidays. Instead of getting disposable everything because it's "easy," which we all do sometimes, I'm switching to fabric. 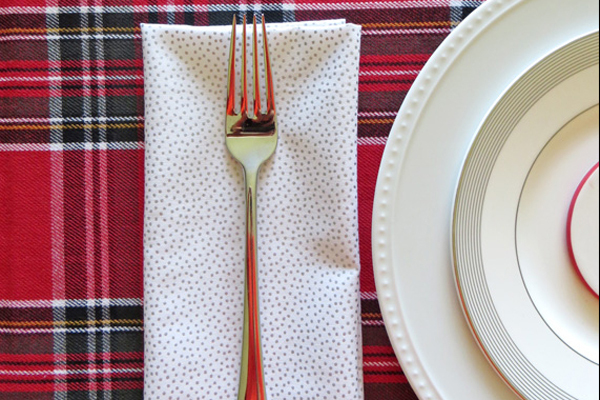 I whipped up some pretty cloth napkins for a party last year and they were a big hit--not to mention quick to make and machine-washable--so I'm here with the tutorial. 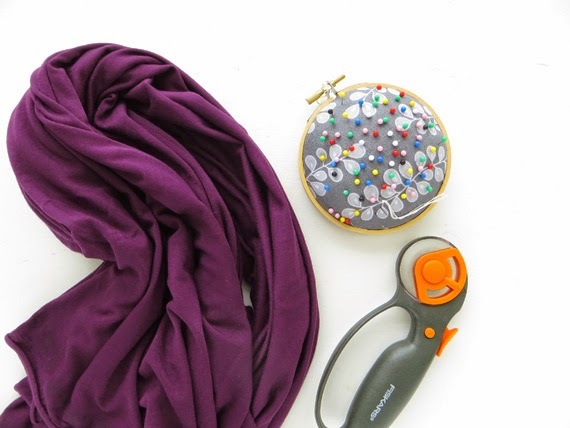 Even if you're a beginner, all you need to do today is use an iron and sew in a straight line. You got this. Hi, everybody! I'm Paige from Little Nostalgia and I'm back with another easy sewing project. And I define easy as "if you can sew in a straight line, you can do this." Now that the weather is (mostly) cooperating and we're starting to spend a lot of time outside, I like to have a summery tote bag I can grab for snacks, water, sunscreen, etc. I wasn't finding anything at the store that made my heart sing, so I thought, heck, I'll just do it myself. 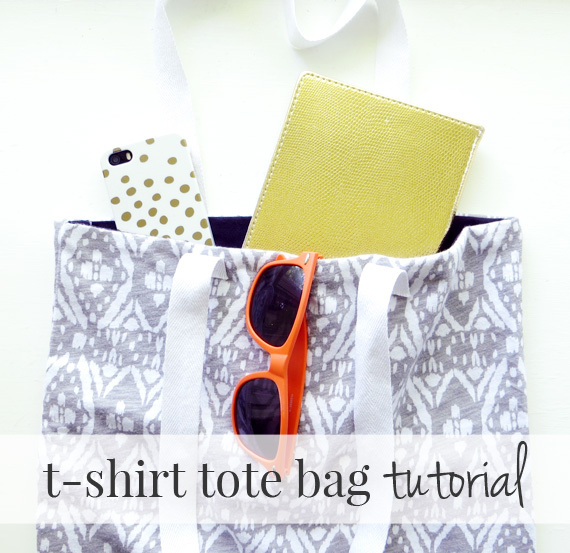 You can grab t-shirts from the back of your closet or hit up a thrift store to find a cute pattern. Hi, everybody! I'm Paige from Little Nostalgia and I suffer from a devastating condition known as Food On My Clothes Syndrome. It strikes when I'm making dinner, minding my own business, and suddenly I look down and there are mystery splatters all over my pants. Again. Because this is a chronic condition that will seemingly never go away, I have a collection of aprons. 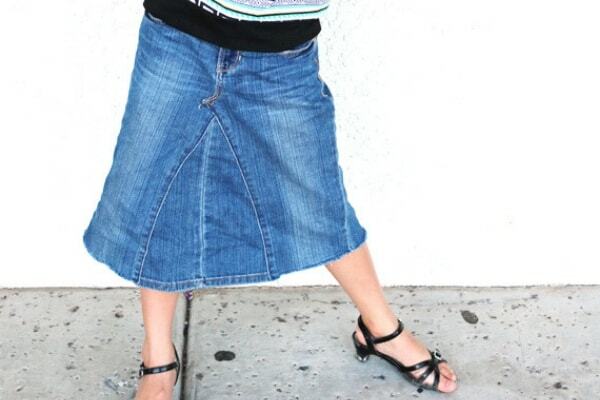 They're perfect for a beginner to whip up, and all you need are a couple of fat quarters and some sturdy cotton trim. I like to make seasonal varieties so that I look festive while hiding the fact that I'm impressively clumsy. (Heck, even if you're not the Splatter Queen that I am, a washable cotton apron is still handy to have around.) Let's jump into the tutorial, shall we? Hi, everybody! I'm Paige from Little Nostalgia, and I'm here today to tell you about the easiest sewing project ever. 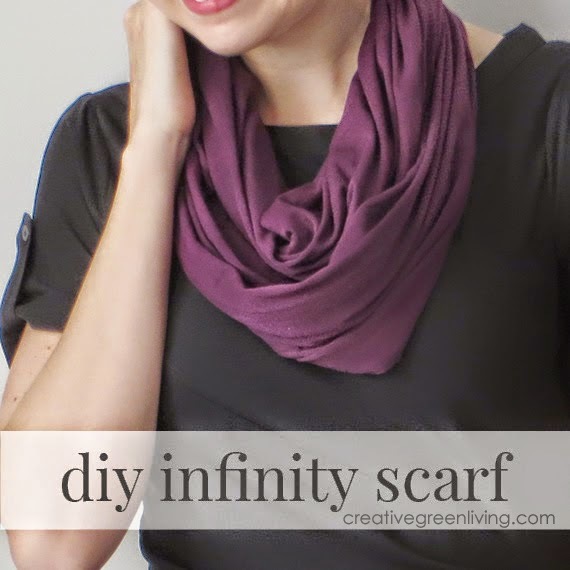 Infinity scarves are my siren song and as far as I'm concerned, one can never have too many. (Overflowing closet, what?) Since buying every scarf that catches my eye isn't too great on the wallet, I learned how to whip them up myself and save a little dough. 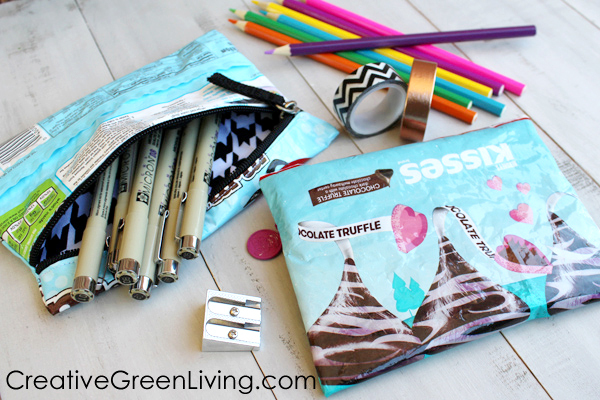 Here's how you can DIY your own, too. Back in April I published a tutorial for how to make an apron from old jeans and it took off like wild fire! 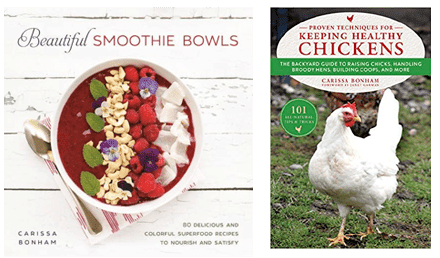 It is not only one of my most popular posts this year - but one of my most popular posts EVER. Have you seen it yet? If not, be sure to check it out here. I tried to make the tutorial super beginner-friendly. 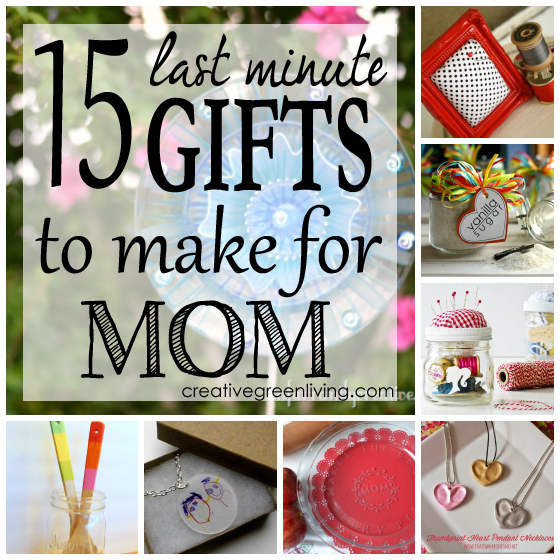 It's a great, inexpensive gift idea for the holidays! I've been going Halloween Costume Crazy! 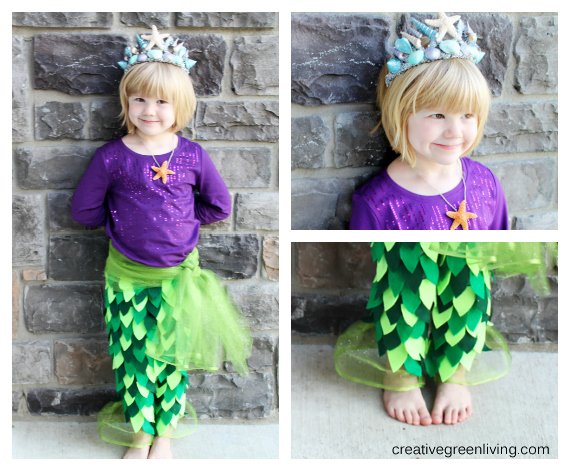 Most of my costumes are for boys but when I found out one of my friends wanted help coming up with a mermaid costume for her little girl I was delighted to get involved! We made the tail with pants instead of a skirt to make it easier for an active girl to do her thing without worrying about tripping or wardrobe malfunctions. 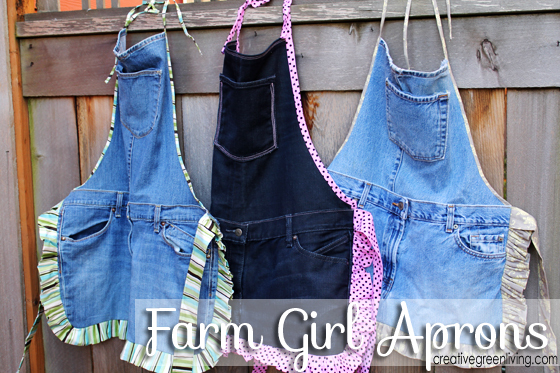 Have you seen my Farm Girl Apron tutorial yet? I'm so thrilled with the great response its gotten. Thank you to those who've already seen and pinned it! This last week I spent some time making more aprons from the tutorial and I wanted to show them to you! 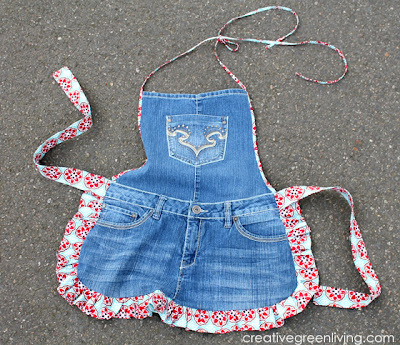 First of all: who doesn't love looking at cute aprons? Second: I want you to see how changing the color of your jeans and trim can give you a different look. Third: These aprons are actually FOR SALE. 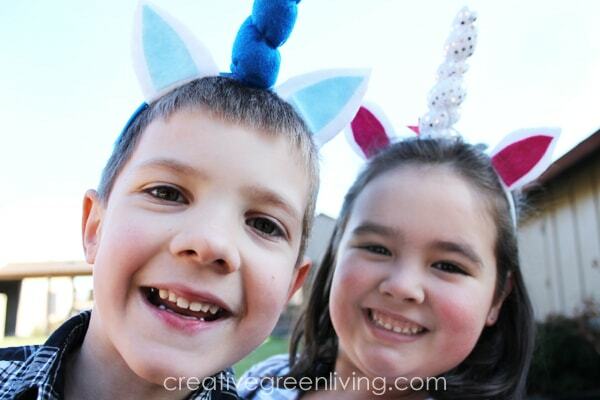 So if you don't want to make your own, I'd love to send you a handcrafted, Creative Green Living original! PS - If you love aprons too, be sure to follow my Apron Addiction board on Pinterest! 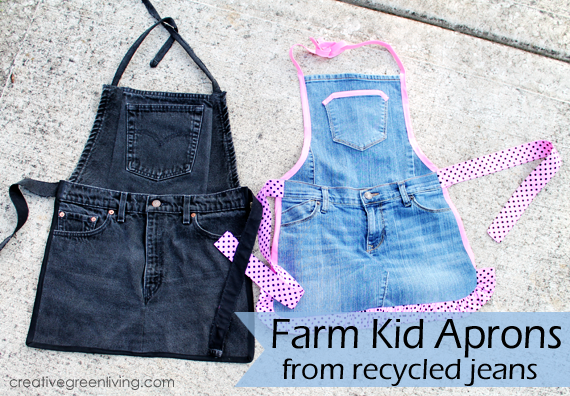 You're here to learn how to make a cute apron from recycled jeans, right? I made it as a gift for my stepmom's birthday a few years ago. 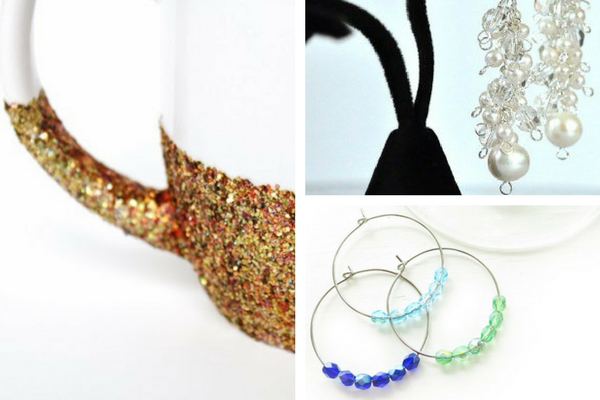 Not only did she love it - but thousands of Pinterest and Facebook users loved it, too! This apron pattern has taken off like wild fire. I can't wait to teach you how to make it! 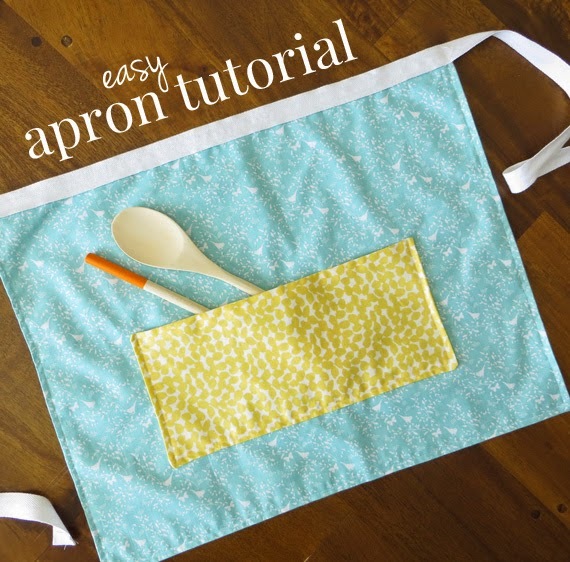 If you consider yourself at least an "adventurous beginner" with a sewing machine and can follow instructions, you can make this apron! If you have any questions or need clarification on any of the steps, leave me a comment and I will get back to you! But back to the bias tape. It's easier than you might imagine and you don't need one of those fancy Bias Tape Machines to do it (although I wouldn't object to any one giving me one of these. 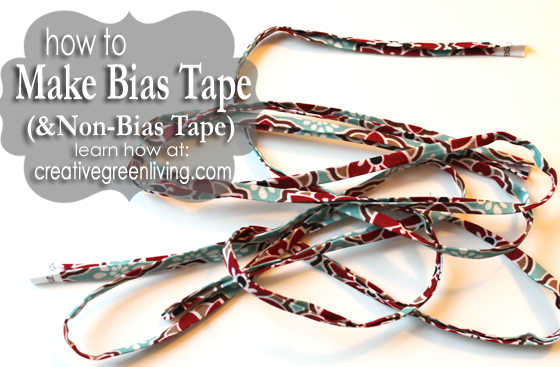 I'm sure it would come in handy if you needed a lot of bias tape on an ongoing basis). A great way to go green with your clothes is to wear them until they can't be worn any more. But what about once they get holes? 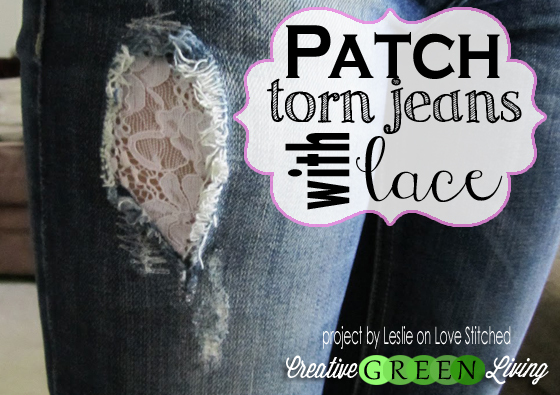 Small holes in casual jeans aren't usually a huge deal but if they are bigger or show more skin than you'd like, you can save your pants by patching the holes with lace. 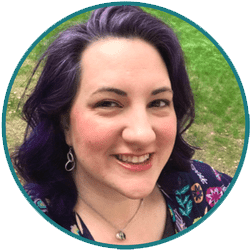 Leslie from Love Stitched shows you how to both reinforce the hole to prevent further tearing and also how to back fill with pretty lace to make some stylish pants. 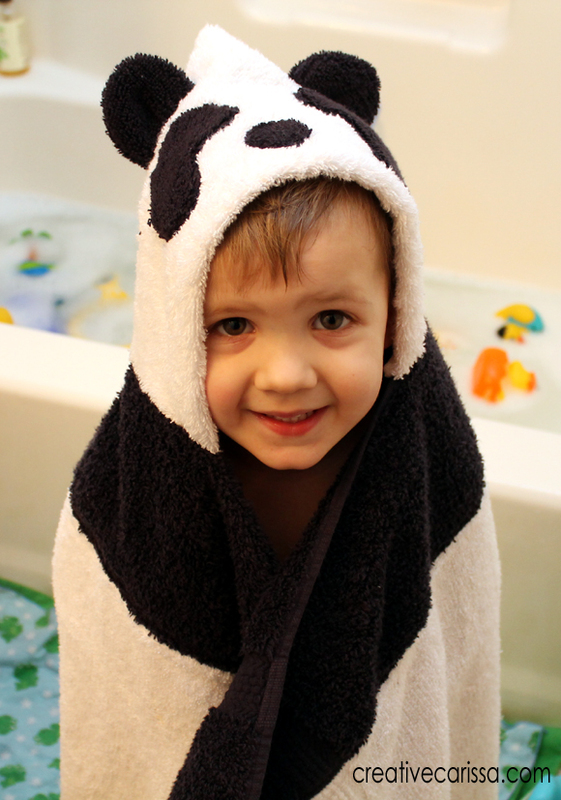 My son loves panda bears (love panda bears, too? 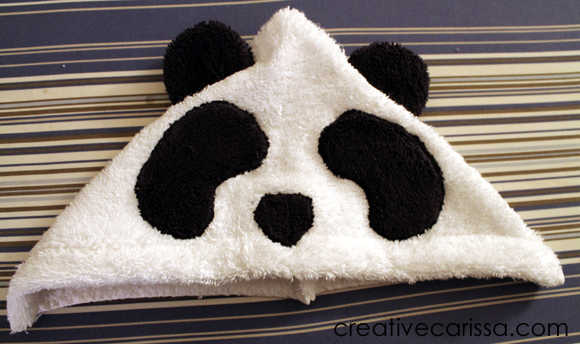 You might like my panda party, panda ears tutorial or panda pancakes). Now that he's 2 and huge, he needed some bigger towels for bath time. 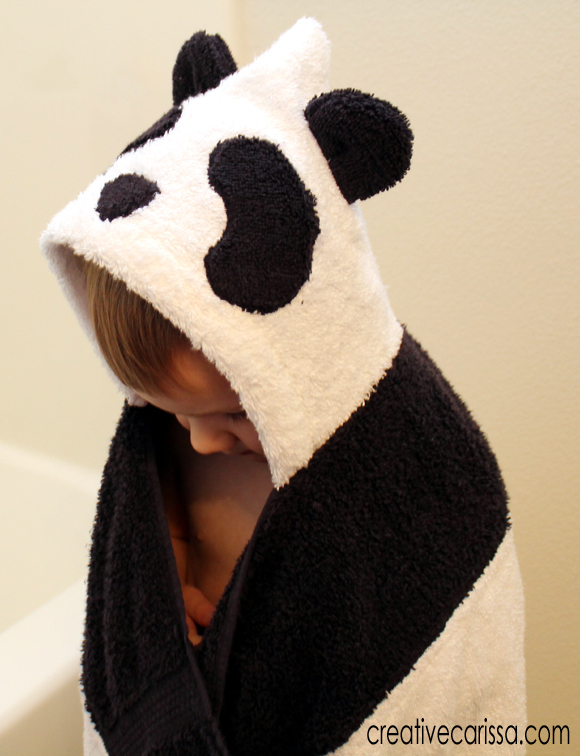 What better creature to make a hooded towel like than his favorite snuggly panda? I followed the same technique taught by Amber at Crazy Little Projects. 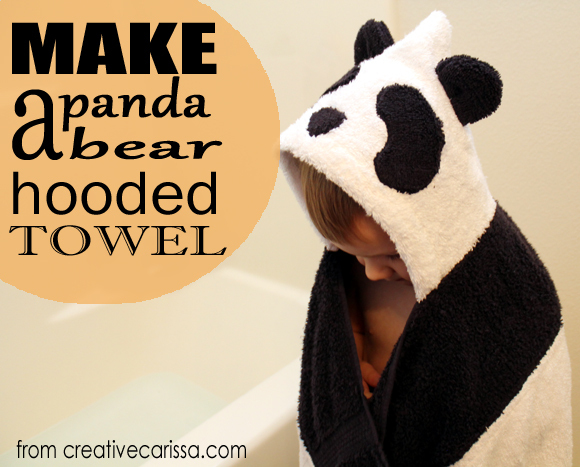 If you have never made a hooded towel, do yourself a favor and read her very thorough tutorial. Then come back here and see how to adapt it to make a panda. Sewing machine, scissors, iron, Walking Foot if you have one. 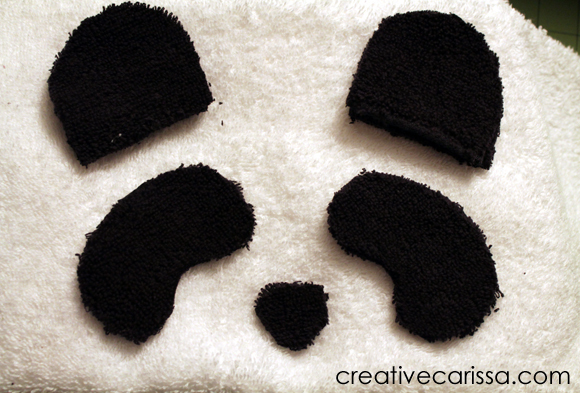 Black washcloth: Cut out 4 ear shaped pieces (remember to cut them bigger than you need them). Then iron on the fusible interfacing to the remaining washcloth material. Cut out two kidney bean shaped pieces for eye shadows and a nose. 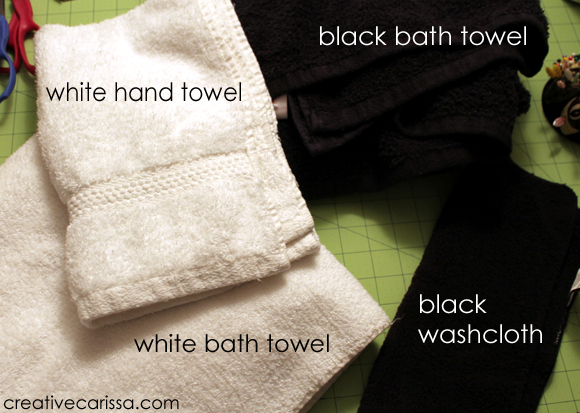 Fold in the front edge of the hand towel past any band that might be on it. Using white thread, sew across. This is the front edge of your hood. Switch to black thread. Stitch around the curve of the ears, leaving the flat edges open. Flip ears so stitches are inside. Iron down the eye patches and nose onto the hood. 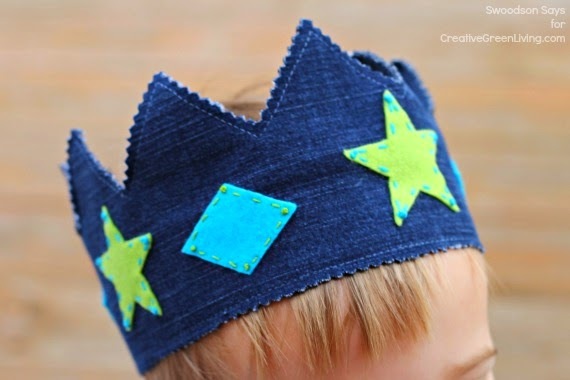 Use a zig zag stitch to applique these pieces to the hood. Cut slits in the hood where you want the ears to go. Insert ears and sew to hood from the inside. Fold hood in half down the middle of the face, right sides together and sew with white thread. Placing right sides together and being sure to line up any bands on the narrow ends of the towels, lay the long black bath towel strip along the long edge of the white bath towel . Sew together and open. To keep the seam flat, I opened up the back side of this seam and stitched down the length of the towel on both sides. 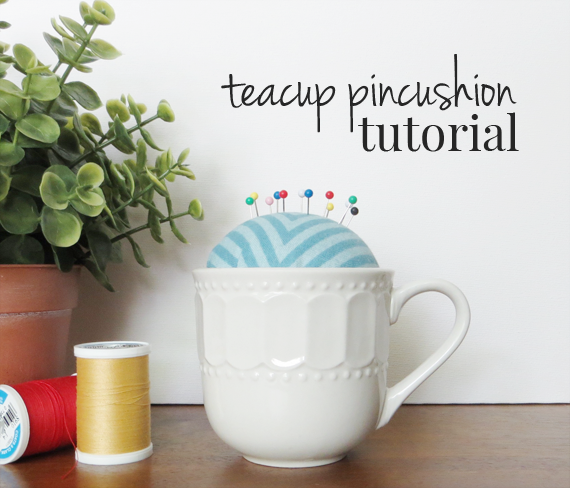 Make a tuck along the top edge of the black section and pin in place (refer to Amber's tutorial).